These are dear, dear pictures to me. 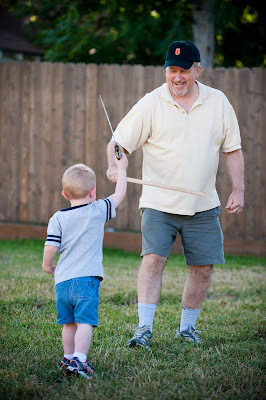 Pictures of my son having a sword fight with my dad (aka, Papa) just a few short weeks before my dad died of cancer. It's hard to believe these pictures were taken a mere two months ago! But what a great memory. Live one's life so that it is worthy of respect and honor. Such cool photos. 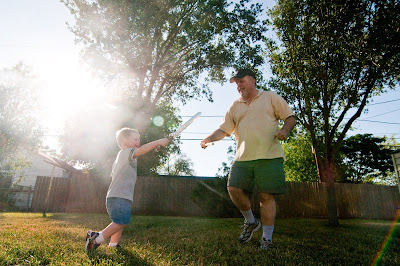 I only met your dad once but really liked him...and you can see the utter joy on his face playing with his grandson. that second pic is really good! They are precious photos! I'm so sorry for your loss! Oh, I am sorry to hear of your loss! he looks like he would have been a great man to know. Great pics and great memories! Adorable pics. I know they have a very special meaning to you and your family. Sorry for your loss. Love and hugs to you, Carrie. Thanks for sharing these wonderful photos. Thanks for sharing these beautiful pictures, Carrie. So sorry to hear about your dad. That's such a precious memory! I am so sorry for your loss. And the loss your son will have without his grandpa. I grew up with one grandpa, and they make all the difference in the world of child. Such sweet pics to remember him by. Hopefully your son will remember him, too. Bittersweet pictures. I'm glad you have them, though. I am so sorry for your loss. I am glad you will forever have pictures to remember your father. The photos are beautiful and convey such love. Thanks for sharing them. Thank you for sharing such precious photos and memories with us. I'm sure Bookworm 1 will also treasure them in the years to come as you share stories with him about your dad! Precious. My boys were very little when my dad died (18 mos and 4 yrs) and I cherish each picture I have of my dad with them. I have them around my house and in each of their bedrooms and we talk about Grandpa a lot, so that he is still a part of their lives.